Hello crafty friends, Sarah here with a quick technique based blog post using the awesome graffitti stamp, exclusively found only in the June Mixed Media kit. This kit and stamp was designed by the gorgeous Elisa Ablett! How lucky are we to have her on the design team. 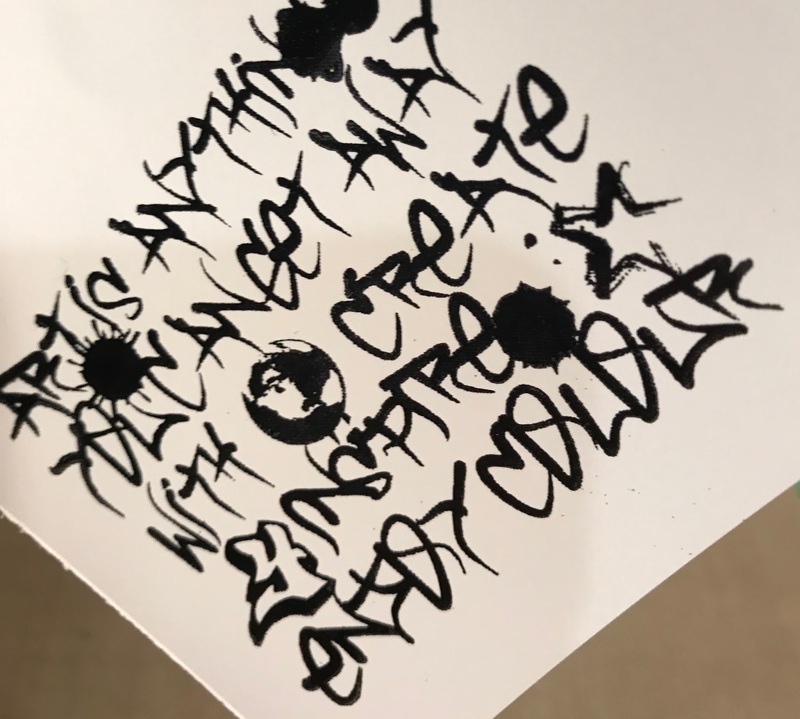 As soon as I spied the graffitti stamp, I knew I just had to have it. The range of Shop and Crop once off kits can be purchased online by clicking here. So here are four ways you can use this graffiti stamp to create a cool background. This stamp is ideal for multiple prints side by side, as Elisa has done in her mixed media kit. You could use these techniques to make a card background or for a scrapbooking layout or pocket page. 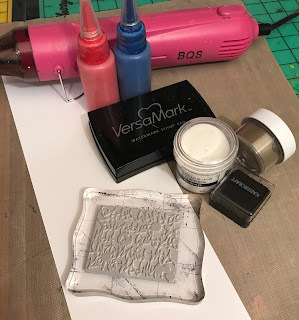 Everything you will need to try these out is pictured above - a heat gun, stamping block, ink, embossing powder (I used clear and gold) and paint. The Mixed Media kit comes with three small bottles of paint which are ideal. First technique is simply stamping with ink. 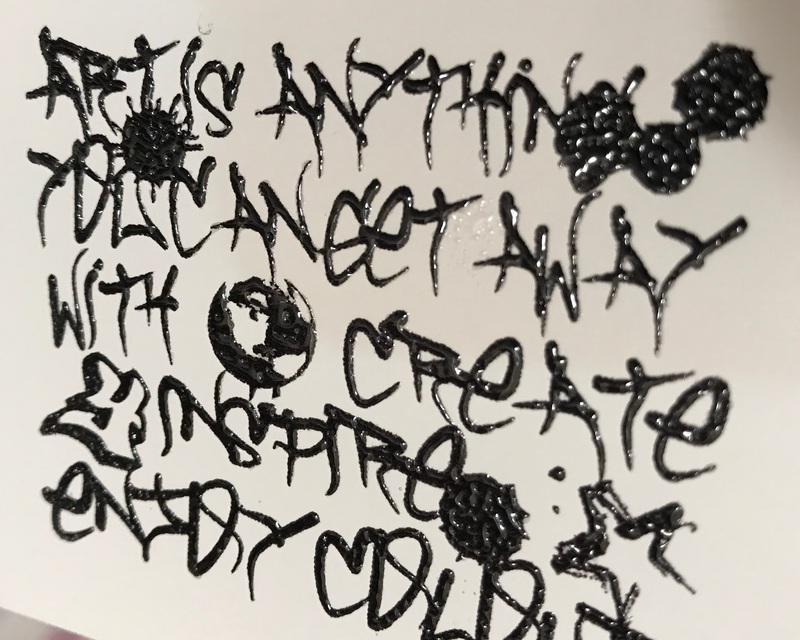 Here I have stamped with black StazOn ink. You could however use any colour ink you like. I think multi coloured or an ombre inked look would look fantastic. Secondly, I then added some clear embossing powder over the black ink while it was still wet and heated it with my heat gun. Shop and Crop have a wide range of embossing powders that can be found here. As you can see in the photo below, the embossing powder gives a shiny, slightly raised finish to the stamped image. Continuning on with my love of embossing powders, this time I have applied VersaMark, stamped and applied gold embossing powder. This is then heated with a heat gun and wow, the shine is gorgeous! You can just imagine this on a wider background - lots of bling! Lastly is stamping with paint....yes, it sounds messy and it can get that way, but the little bottles of paint provided in the Mixed Media Kit are ideal for this technique. The tips of the bottles make application to a small surface, such as a stamp, easy to do. The lovely thing about paint is that you somewhat control where you place it. 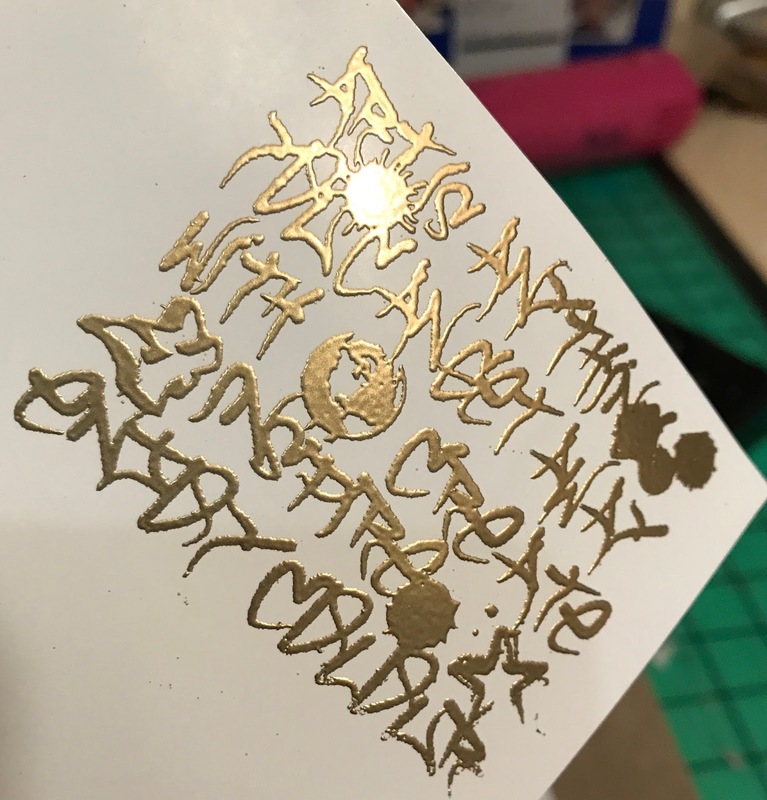 I say 'somewhat' because I find it does it's own thing and can move a little when stamping, depending on how much paint you put on the stamp. As you can see pictured above, I have used two colours, but imagine stamping with the colours of the rainbow! Could be alot of fun for a layout background. Thankyou for joining me for today's technique - I look forward to seeing how you use your stamps to create funky backgrounds. Remember though, if you do want this exclusive stamp - be sure to order your Mixed Media Kit today and use the code SR5 for a $5 discount at the checkout!